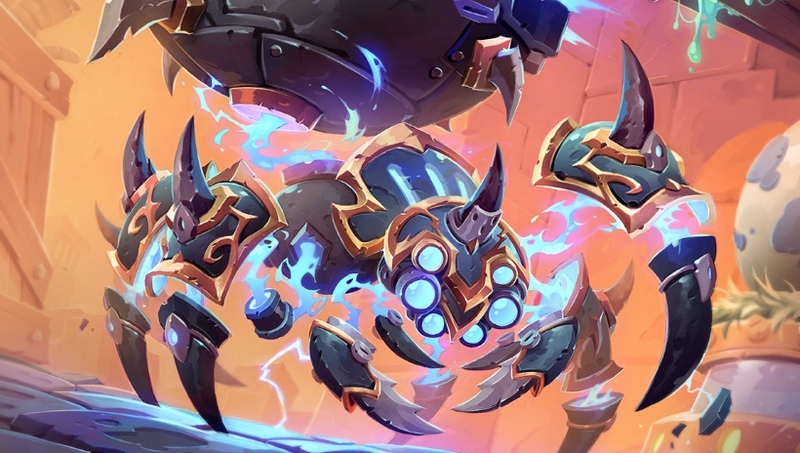 Our Mech Hunter deck list guide features the best Rise of Shadows deck list for Season 61 of Hearthstone (April 2019). Our Mech Hunter guide also contains Mulligan advice, card combos and strategy tips. Mech Hunter is a Hearthstone deck that’s crept up to the top tier of play once again since the launch of the Rise of Shadows expansion. It’s been given a lot of help thanks to a number of new cards that synergise with the powerful Deathrattle package available to Hunter. Altogether, that makes it a formidable looking deck in a fresh meta. You can read on below for our in-depth look at how this archetype is faring in the early days of Rise of Shadows. We’ve highlighted the best version of the deck that’s seeing play in Hearthstone right now, though we’ve seen a few small changes here and there that may suggest additional tweaks are on the way too. If you’re looking to try it for yourself, though, you can also find a general overview of the strategy involved in playing this deck as well as some Mulligan advice for the latest update. Further down the page from that you'll also find a run through of all the combos contained in the deck, so you can start thinking about how it falls together before jumping on the ladder! Mech Hunter is a mid-range deck that aims to fully exploit the synergies of multiple Mech cards across the class and in the Neutral set. As such, it’s a very minion-heavy deck that hopes to build up a significant board presence and then trigger the Deathrattle effects on many of these creatures in order to gain additional value from them. In many cases, this will be too much for your opponent to handle. With the release of Rise of Shadows, the Hunter class has been given a handful of new cards that promote a synergy with Mechs. Whether this or the more Deathrattle-focused version emerges as stronger remains to be seen, but both have potential in the new expansion. Early game: Fight for the board in the early game with your low-cost minions. Many of the creatures you play have useful Deathrattle effects that can make them awkward for your opponent to fully clear from the board, so take advantage of that in follow up turns with a buff from Fireworks Tech. You also have Bomb Toss as some removal for your opponent’s opening drops too, which will also leave a Goblin Bomb on the board for you to use later. Mid game: Continue developing your board further as you head into the mid game. You get access to some of the more impactful Mech synergies at this stage too, which is where you can surge out into the lead. A lot of this power is within Ursatron, Oblivitron and Nine Lives as they are all very useful tools that can be a big help in tutoring Mechanical Whelp or triggering its huge Deathrattle effect multiple times. Late game: By the time the late game rolls around you should be in a dominant enough position on board to finish off your opponent. You can continue to find ways to draw extra value out of Mechanical Whelp or go for Unleash the Beast to keep your opponent on the backfoot. Of course, Zul'jin is also there for the potential of a crazy finisher full of minion resummons, spells and more buffs. 1. You’ll want to fight very strongly against aggro opponents for board control. Luckily, you have a strong set of sticky Deathrattle minions that can do just that. 2. Try to get the most out of every one of your buff cards to help you trade up into more expensive minions or ensure they survive for extra value later. 3. The Goblin Bomb tokens you generate with Bomb Toss are particularly good for trading. Not only can you remove minions but you’ll also chip away at your opponent’s life total. 4. If you do fall behind, Zilliax is a great catch up card as it will make an impact on the board immediately and leave a robust Taunt behind to slow them down further. 5. Prioritise immediate effects over slower card draw or set up plays as if you spend too long preparing for future turns you may get taken out of the game before you can even reach later stages. 1. Play aggressively and try to finish off control opponents before they have a chance to stabilise the match against your multiple minions. 2. Try to bait out board clears when you know one could be on the way. You want to entice your opponent with just enough so they feel forced to use it, but leave enough resources in hand so you can establish a board again next turn. 3. Another way to counter board clears are all the deck’s Deathrattle minions as they will stick on the board in some form when killed. Also, if you have some Goblin Bomb tokens your opponent will take a significant chunk of damage when they clear. Replicating Menace is great board clear insurance too. 4. You don’t have much hard removal, so save Venomizer and Spider Bomb for when there’s one specific target you need to get rid of to push damage through. 5. Going into the late game is bad but you have Zul'jin, which can be a bit of a Hail Mary play but it’s more than capable of clutching out a win. 1. Mecharoo: A perfectly OK one-drop which makes it an obvious keep. The Deathrattle is nice to keep you on the board too. 2. Ursatron: A well-rounded minion that comes with the useful bonus of refilling your hand in the early stages. 3. Animal Companion: Another early game drop that is ideal to play on curve to continue building your position on the board. 4. Springpaw: Another one-drop so worth a hold, but this allows you to respond to your opponent’s threats more quickly thanks to the Rush keyword. 5. Bomb Toss: Solid early game removal that also helps your develop something on the board at the same time. There are quite a few powerful combos important to finding success with Mech Hunter. We’ve listed all of those for you below so you know what to work towards when playing the deck. - Find ways to enable your Goblin Bombs to attack through buffs or the Magnetic keyword on some of your other Mechs as then you’ll also have more control over how their Deathrattle is triggered. - Fireworks Tech can be used to both empower a minion and take advantage of its Deathrattle mechanic. Consider cards like Spider Bomb and Mechanical Whelp in this context. - Venomizer, Spider Bomb and Zilliax are Magnetic, which means you can fuse them with another friendly Mech by dropping them to the left of that other minion. Drop it to the right if you want them to remain separate. - Spider Bomb has a powerful hard removal effect on its Deathrattle so ensure you have a way to trigger it and do your best to make it hit your opponent’s biggest threat. - Using Nine Lives strategically is the way to find true success with this deck. Try to save it for the late game when you can use it to Discover another copy of Mechanical Whelp as its Deathrattle effect is huge. - The cards you want to keep in mind for activating Mechanical Whelp are: Fireworks Tech, Nine Lives and Oblivatron. You can also self trigger it with Bomb Toss or you can buff it with a Magnetic creature for an especially powerful play. - Zul'jin is a risky play but one that can cause a absurd upset if you manage to reuse a lot of your previously cast spells once again to bring out more minions, trigger Deathrattle effects or buff your creatures. Mecharoo: A decent and sticky one drop that will make use of many of the buff cards and effects in the deck. Fireworks Tech: Another strong buff card but this one comes with the added bonus of triggering a Deathrattle effect at the same time for even more value. Spider Bomb: The deck’s only proper hard removal though it can be finicky to activate. Make sure you save it for when it’s absolutely needed. Nine Lives: Vital for making use of more copies of Mechanical Whelp as the card has one of the strongest Deathrattle effects in the deck. Oblivatron: Similar to Nine Lives, although this card is all about making a massive tempo play. Hitting Mechanical Whelp with this gives you 25 points worth of stats on the board for just six Mana! Mechanical Whelp: With the many ways you can buff this card or trigger the Deathrattle effect multiple times it represents some excellent value once the 7/7 creatures from it are on the board. Zilliax: A strong and versatile late game drop that can help you survive with some healing or push through a troublesome Taunt minion so you’re free to attack an opponent directly. Zul'jin: Repeating some of the deck’s spells can serve as both an extension of your win condition or as a way to get back into the game late if you’ve fallen behind. It’s a little risky, though, so some decks may prefer Boommaster Flark! Is this deck still good with giggling nerf, or I have to replace her or change deck?